You may wonder what the Flying Teapot is, especially as it is firmly grounded in Ferndown. I was amused when I walked through the door to find dozens of unusual teapots hanging from the ceiling, all containing down-lights. On my left were corrugated iron walls and to my right, the walls were boarded. I had a double take, was I in another world? Then I noticed the tables and chairs. It was definitely a restaurant/café, and at the back was the pièce de résistance. No, not Dudley. I will get round to him later. 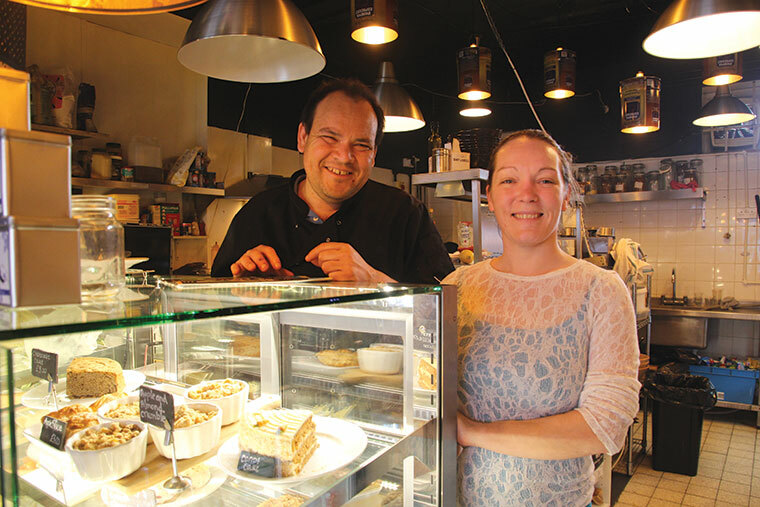 It was a glassfronted counter crammed with mouth-watering homemade cakes and desserts. The owner, trained chef Luke Armstrong is from Australia, which explains the quirky surroundings. He has brought a bit of the outback to Ferndown and you will usually find him behind the counter creating wonderful dishes. When best-selling author Carol Rivers and I visited to sample the menu, his assistant Louise was helping out. An ace in the kitchen, Luke has owned and run restaurants throughout Australia. His concept is to sell food he’s discovered all over the world, which is why his menu is so exciting – and how I came to order a Thailand Dream. He uses fresh ingredients, including fresh herbs, some of which he grows seasonally in plant troughs outside the Flying Teapot. In the summer, Luke also adds a huge salad bar, which he says was extremely popular last August, when the Flying Teapot first opened its doors. “We were very busy. And customers loved sitting in the sun and dining al fresco,” he adds. 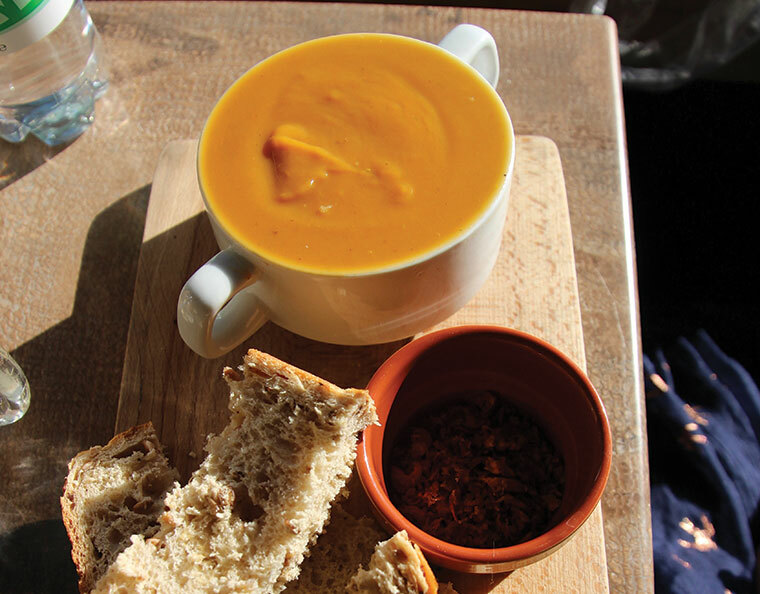 Intrigued to taste a freshly made Roasted sweet potato and truffle soup with brown bread and butter, Carol couldn’t wait for her dish to arrive. It was served with a pot of crispy dried onions, which she said complemented the rich, creamy soup’s caramelised, roasted taste. The addition of truffles she said was delicious and it wouldn’t surprise me if she manages to fit this delicacy into a future novel somehow. 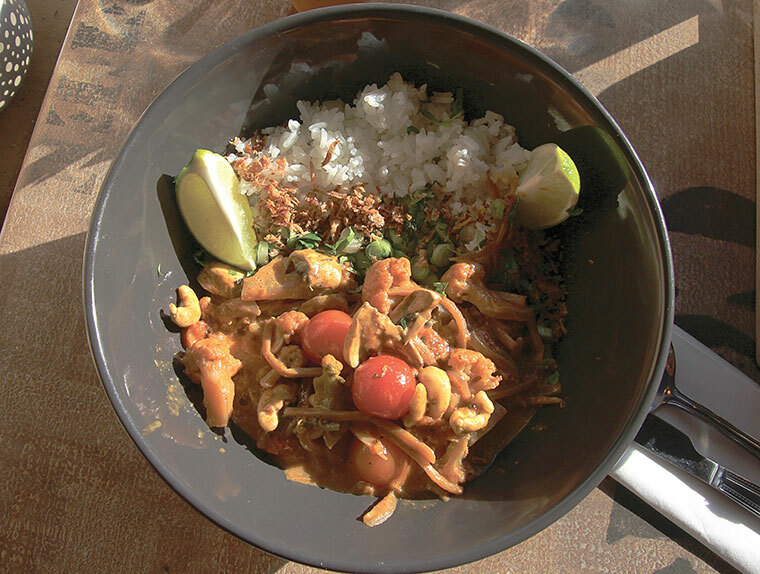 As for my Thailand Dream, it was crammed with ingredients, not least of which was coconut milk. I discovered bamboo, cauliflower, broccoli, mushrooms, tomatoes, peanuts and fresh mint, and there were slices of tangy lime served with a portion of plain rice. My eyes almost popped out of my head when I saw how big the dish was. To call it hearty was an understatement. I wouldn’t normally eat so much at lunchtime, but it was so delicious I couldn’t stop myself finishing the lot. Even Carol found her large bowl of soup really filling. I washed my extravagant meal down with a satisfying mango madness smoothie and Carol opted for some sparkling water. Needless to say, we were both unable to sample any of the enticing desserts. 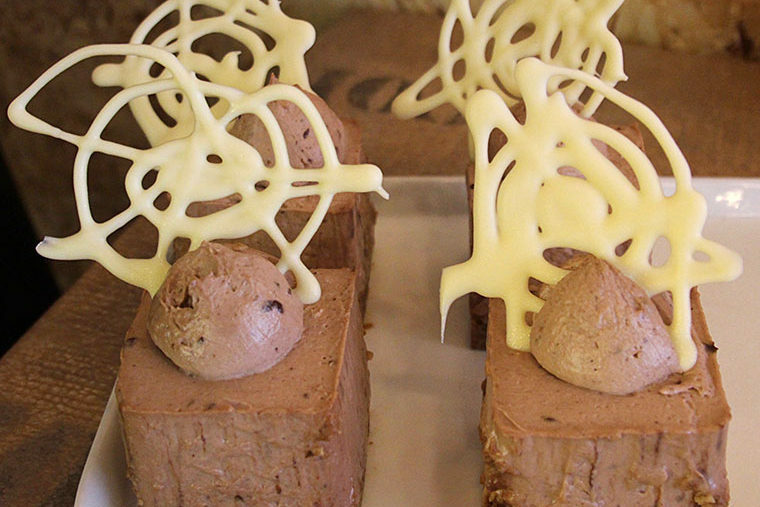 I was particularly sorry as two of my favourites: chocolate cheesecake, and bread and butter pudding, were on offer. There was also a stunning apple and almond crumble and equally enticing strawberries and cream cheesecake peeping out between the array of cakes. I am absolutely going back to enjoy a dessert with a cup of coffee. Luke’s food definitely has a magnetic effect. The Flying Teapot is also dog-friendly provided the dogs are on good behaviour. Which brings me nicely around to Dudley. He is a gorgeous, mild-mannered Labrador who can be found snuggled on a sofa at the back of the café and he has got a bit of a following. “Customers love to come in and stroke him,” says Luke. The restaurant/café and al fresco area combined seat over 50 diners. The Flying Teapot is currently open Tuesday to Saturday 8am-4pm. In the summer it will be open seven days a week 8am-6pm,and three nights a week. It’s a real gem of a place and got quite busy whilst we were there, so word is obviously getting around. With free parking right outside the door, a cuppa or bite to eat can be a quick and easy treat at the Flying Teapot. We have been visiting the Flying Teapot for a few weeks now on a Saturday morning at around 11am for about 20/30 minutes. We have had some lovely tea, coffee and cakes and were hoping this was going to be a regular event, especially as they are dog friendly. I had recently read the article about them in your magazine and was pleased to be supporting the enterprise. Unfortunately today we were told we were no longer welcome if we only wanted a drink and cake, only if we wanted breakfast. We were very perplexed by this as the cafe only had two other tables with people being served. What a shame that a private business trying to make a mark finds it so easy to tell customers that they are no longer welcome as essentially they are not spending enough money. We are a small cafe and as you could see when you first walked in there was no room for anyone, it wasn’t till the everyone had finished there breakfast that there was two tables left, a small cafe the days can’t have everyone drinking coffee and not eating, I’m shore you would understand that a cafe can not work if this was the way it was to be, we are not a high street chain that has lots of room for people to seat for all day. If you come ether side of breakfast and lunch you are more than welcome.